Vancouver, British Columbia – June 5, 2018 – New Destiny Mining Corp. (TSXV: NED), (the “Company” or “NED”) is pleased to announce the start of the 2018 field exploration program on the Treasure Mountain Silver project, located near Tulameen, B.C. The Company has received a exploration permit to conduct diamond drilling and trenching within the Property. The Company’s Treasure Mountain Silver Project covers 10,700 hectares of geologically prospective ground adjacent to Nicola Mining Inc.’s Treasure Mountain Property (site of the historic Treasure Mountain Silver-Lead-Zinc mine). The Treasure Mountain North Property hosts at least seven gold, silver, lead, zinc and / or copper B.C. MINFILE occurrences in various regions. These include gold-quartz vein, polymetallic veins and porphyry type showings. Some of these mineral occurrences have associated historic underground workings. The Property occurs within the Intermontane Tectonic Belt, which hosts numerous porphyry copper deposits. geochemical anomalies identified during previous work programs on the property. One target area is located in the east region of the property in the Vuich Creek area. Company personnel located an historical hand pit on a silicified porphyritic dyke in this area during the 2017 program. A grab sample from this pit returned 6.24 grams per tonne Gold. Other samples in this area were also anomalous for gold. Additional prospecting and rock geochemical sampling is planned for this target area. The Company identified a new target area during 2016 in the southeast region of the Property. 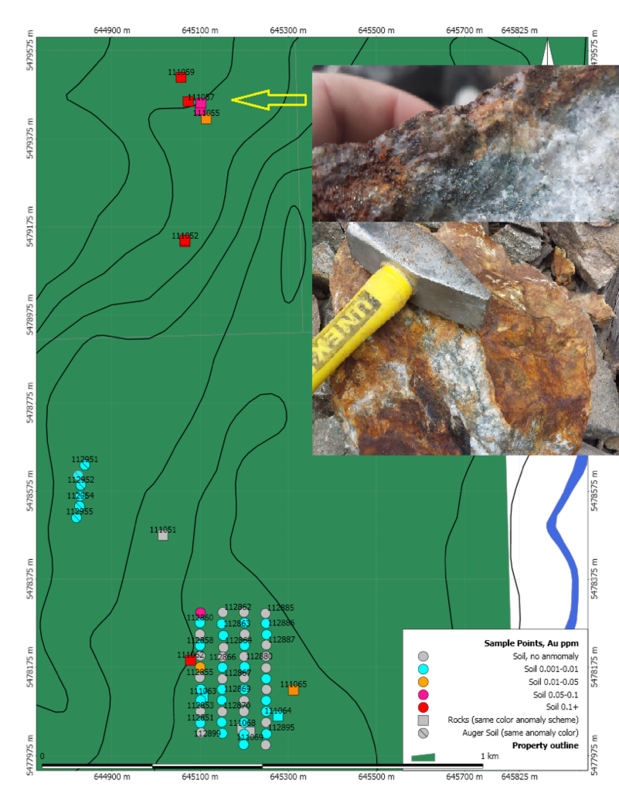 Multiple till samples collected using an auger drill in this area returned anomalous values for copper, with a few samples returning anomalous values for gold. The Company is planning additional work in the area of these geochemical anomalies during the 2018 program, including prospecting and rock and soil geochemical sampling. The Company has a permit to conduct diamond drilling and trenching in this region of the Property. Following Phase I results, the Company will identify drill and trench targets and begin construction of drill pads and clearing of trench sites.